Freshwater cultured pearl. Pearl Rings. Hoop Earrings. Wheat Chains. Diamond Rings. Pearl Earrings. Jewelrypot is dedicated towards providing you with the best quality, service, and prices of fine diamond, gemstone, pearl, and silver jewelry. 7.75" GENUINE NATURAL KEISHI ROSEBUD PEARL & 14K GOLD BRACELET. 100% NATURAL ALL NACRE KEISHI ROSEBUD PEARLS! PEARL: 100% natural KEISHI ROSEBUD PEARL. GLOWING LUSTROUS "DRUZY" TEXTURED SKIN! This necklace, earrings and bracelet set is made of solid 14k gold (not plated or filled), featuring fine quality white freshwater cultured pearls. Necklace is 18in long with 1.25in dangling part, bracelet 8in long, earrings 1.25in long, Cultured Pearls 9-9.5mm wide. 14k yellow gold filigree fish hook clasp. Stamped 14k on clasp. This set is made of 14k gold and high quality freshwater cultured pearls. Freshwater cultured pearls with a 14k gold lobster lock. Chain Type Strand. Clasp Type Lobster Claw. To clean your gold jewelry, soak it in a bowl of mild liquid detergent and lukewarm water. The pearls are cultured, freshwater, authentic and real. the gold is solid 18k yellow gold and is marked "750". i am have been a jeweler for over a decade and buy only the highest quality, shape, and luster pearls. 14k Yellow Gold 6-7mm White FW Cultured Near Round Pearl Bracelet 7.5"
Features: 14k Yellow gold - Freshwater cultured pearl - Pearl clasp. Material Primary - Purity: 14K. Stone Type_1: Pearl. Pearl Type_1: Freshwater. Bracelet Type: Gemstone. Material Primary - Color: Yellow. Iridesse by Tiffany & Co. 18K yellow 3-row multi-color pearls bracelet. It is hallmarked "IRIDESSE" "750". IRIDESSE BY TIFFANY & CO. 18K YELLOW GOLD 3 ROW STRANDS PEARL BRACELET. Metal: Yellow GoldLength: 7.5 - 7.99"Brand: Tiffany & Co. This is a freshwater cultured pearl link bracelet. The pearls are beautiful, cultured and freshwater pearls. The gold is solid 14k gold & marked 585. This bracelet is wire wrapped with pearls lined in the center. This set is made of 14k gold and high quality freshwater cultured pearls. Freshwater cultured pearls with a 14k gold lobster lock. Clasp Type Lobster Claw. Chain Type Strand. To clean your gold jewelry, soak it in a bowl of mild liquid detergent and lukewarm water. This set is made of 14k gold and high quality freshwater cultured pearls. Freshwater cultured pearls with a 14k gold lock. Clasp Type Pearl. Chain Type Strand. To clean your gold jewelry, soak it in a bowl of mild liquid detergent and lukewarm water. GORGEOUS RARE GENUINE SOUTH SEA SALTWATER CULTURED PEARLS FROM INDONESIA ! 100 % REAL SALTWATER SOUTH SEA PEARL AND REAL GOLD! The bracelet is finished with YELLOW GOLD BALL CLASP. PEARL: South Sea pearl. Freshwater cultured pearl. Pearl Rings. Hoop Earrings. Wheat Chains. Diamond Rings. Pearl Earrings. His & Her Ring Sets. Diamond Earrings. This set is made of 14k gold and high quality freshwater cultured pearls. Freshwater cultured pearls with a 14k gold lock. To clean your gold jewelry, soak it in a bowl of mild liquid detergent and lukewarm water. Type: Freshwater Cultured. Pearl Information Bracelet Information Colour: Varying hues of White. Minimum Total Carat Weight: 0.720 carat. Gemstone Informations Number of Stones: 20. Stone Size: 5.5 MM - 7.7.5 MM\. This set is made of 14k gold and high quality freshwater cultured pearls. 4.5mm-5.0mm Knotted Black Freshwater Cultured Pearl Strand with 14k Gold Lock Necklace and Bracelet Set. Freshwater cultured pearls with a 14k gold lock. This 14k yellow gold toggle bracelet feature beautiful South Sea cultured pearls. Secures with a toggle safety clasp. Type: South Sea Cultured. Clasp: Toggle. 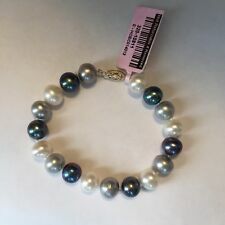 Pearl Information Bracelet Length: 8 In. 7.75" GENUINE FRESHWATER KEISHI PEARL, NATURAL RUBY & 14K GOLD BRACELET. BEAUTIFUL BRACELET HAND MADE WITH GENUINE KEISHI ALL NACRE PEARLS SEPARATED WITH NATURAL FACETED AFRICAN RUBIES AND FINISHED WITH 14K SOLID GOLD FILIGREE CLASP! 14k Yellow Gold 5-6mm White FW Cultured Pearl 3-Station Bracelet 7.25"
Features: 14k Yellow gold - Spring Ring - Freshwater cultured pearl. Bracelet Type: Pearl. Material Primary - Purity: 14K. Stone Type_1: Pearl. Pearl Type_1: Freshwater. Clasp /Connector: Spring Ring. GENUINE NATURAL KEISHI PEARL & 14K GOLD BRACELET. 7.5" fabulous GENUINE BIG KEISHI PEARL AND 14K REAL SOLID GOLD BRACELET! AMAZINGLY LUSTROUS & SPARKLING & GLOWING THE BEST QUALITY 100% NATURAL KEISHI PEARLS SEPARATED WITH 14K GOLD DAISY BEADS! Chimento amethyst & mother of pearl bracelet in 18k rose gold. Necklace / Pendants. Gold Charms. Silver Jewelry. Our exceptional reputation matters most to both us and you …. 14.1 grams. Weekly Specials. Wedding Bands. Fine Jewelry. This set is made of 14k gold and high quality freshwater cultured pearls. Freshwater cultured pearls with a 14k gold lobster lock. To clean your gold jewelry, soak it in a bowl of mild liquid detergent and lukewarm water. •Bracelet Type:Pearl. •Stone Type_1:Pearl. •Pearl Type_1:Freshwater. •Clasp /Connector:Spring Ring. •Finish:Polished & Brushed. •Material: Primary - Color:Yellow. •Chain Width:5 mm. •Sold By Unit:Each. This necklace, earrings and bracelet set is made of solid 14k gold (not plated or filled), featuring fine quality white freshwater cultured pearls. 14k Yellow Gold Freshwater Cultured Pearl Diamond Cut Tin Cup Station Dangle Necklace, Bracelet and Earrings Set. Gold Weight Aprox. 12.03 Grm 14k Yellow Gold. Product Natural Tahitian Black Pearl Bangle. Quantity One Bangle. We specialize in Handmade jewelry and classic antique jewellery. We have a team of excellent designers who are well-versed with the styles and trends in different jewellery collections of history. Real freshwater cultured pearls. British hallmarked. Metal: Yellow GoldLength: 7.5 - 7.99"
Stones; Freshwater Cultured Pearls. Your bracelet arrives with a red and white layout storage jewelry box. Stunning item made in Italy. Priced for quick sale. Freshwater cultured pearl. Pearl TypeFreshwater Cultured. Pearl Rings. Hoop Earrings. Wheat Chains. Diamond Rings. Pearl Earrings. His & Her Ring Sets. 9.02ct Peridot. Diamond Weight Diamond Quality 14kt Yellow Gold. GENUINE INDONESIAN SOUTH SEA SALTWATER AND GENUINE TAHITIAN SOUTH SEA PEARL & 14K GOLD BRACELET. PEARL: Genuine Indonesian South Sea and Tahitian South Sea pearl. Tahitian - 12mm. Pearl color Tahitian: NATURAL UNTREATED BLACK. Metal: Yellow GoldStyle: BeadedLength: 8 - 8.49"
Pearl: Freshwater. Hallmark: Au750(Standard Hallmark for 18k gold). Size: 5.5-6mm Pearl. Wear the right length. A necklace that falls just below the collarbone goes better with a plunging neckline than a high one. From ChinaMetal: Yellow GoldStyle: ChainLength: 7 - 7.49"
Material: Primary - Purity: 14K. Stone Type_1: Pearl. Bracelet Type: Gemstone. Pearl Type_1: Freshwater. GOLD JEWELRY. SILVER JEWELRY. 20 Years Experience In Jewelry. Material: Primary: Gold. Ladies 14k Yellow Gold 6-6.5mm 3 Strand FW Cultured Pearl Bracelet 7.5"
Features: Polished - 14k Yellow gold - Freshwater cultured pearl - Box catch. Material Primary - Purity: 14K. Stone Type_1: Pearl. Pearl Type_1: Freshwater. Bracelet Type: Gemstone. Chain Length: 7.5 in. Pearl TypeFreshwater Cultured. Freshwater cultured pearl. Enduring value. Pearl Rings. Hoop Earrings. Wheat Chains. Diamond Rings. Pearl Earrings. GENUINE NATURAL KEISHI PEARL & 14K GOLD BRACELET. 7.5" fabulous GENUINE BIG KEISHI PEARL AND 14K REAL SOLID GOLD BRACELET! AMAZINGLY LUSTROUS & SPARKLING & GLOWING THE BEST QUALITY 100% NATURAL KEISHI PEARLS INDIVIDUALLY HAND KNOTTED ON 100% PURE SILK! Natural White Mother Of Pearl Center. 14K Yellow Gold Diamond Bracelet Green Leather Watch Band. Solid 14K Yellow Matte Gold. 14k Yellow Gold Fresh Water Cultured Pearl & Faceted Garnet Bead Bracelet 7.25"
Features: Polished - 14k Yellow gold - Freshwater cultured pearl - Garnet - Pearl clasp. Stone Type_2: Garnet. Pearl Type_1: Freshwater. Bracelet Type: Pearl. Material Primary - Purity: 14K. Stone Type_1: Pearl. 14k Yellow Gold 7-8mm White FW Cultured Pearl 3-Station Bracelet 7.25"
Features: 14k Yellow gold - Lobster - Freshwater cultured pearl. Bracelet Type: Pearl. Material Primary - Purity: 14K. Stone Type_1: Pearl. Pearl Type_1: Freshwater. Material Primary - Color: Yellow. Diamond Hoop Earrings. With a look of years gone past our freshwater pearl bracelet is a classic look right out of the pages of history. Platinum Bands. Pearl Rings. Woman's Gold, Silver, Platinum. Diamond Eternity Bands.